A limited edition book of photographs by actor/photographer Dennis Hopper will be released in October 2009. 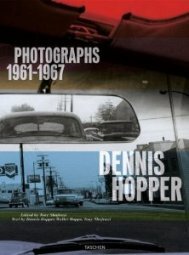 The book, Dennis Hopper: Photographs, 1961-1967, highlights photographs taken by Hopper during the 1960s, of his celebrity friends and other icons of the decade including: Tina Turner, Andy Warhol, Paul Newman, Martin Luther King, Jr., and others. The authors are Walter Hopps, Co-founder of Los Angeles' Ferus Gallery and curator of the Pasadena Museum of Art; filmmaker and art, music and film journalist, Jessica Hundley; and gallerist Tony Shafrazi. This edition of the book is limited to 1,500 copies, all signed and numbered by Dennis Hopper. There will also be an Art Edition, limited to 100 signed and numbered copies, accompanied by a signed print of the photograph Double Standard, by Dennis Hopper. In conjunction with the release of the book, is an exhibition of photographs by Dennis Hopper currently on display at Tony Shafrazi Gallery in New York City. Dennis Hopper: Photographs, 1961-1967 (Signed, Limited Edition Boxed) at Amazon.com.